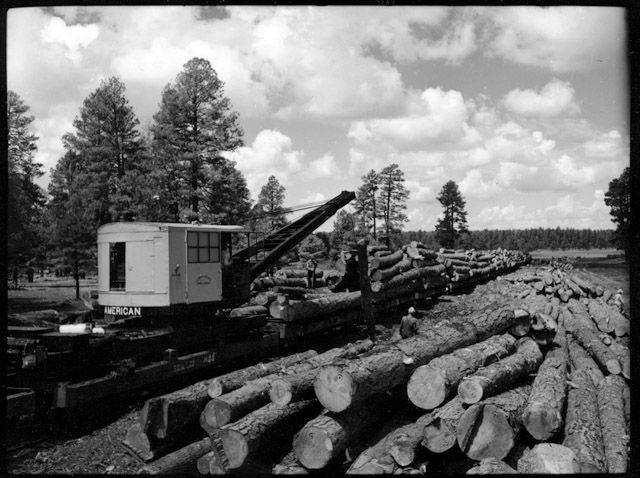 Lumber was plentiful in the ponderosa pine forests of northern Arizona. Demand was high as the railroads were being built, as they needed lumber for trestles, ties, and depots. Flagstaff was the most logical place to begin operation. Mormon missionary settlers created the first sawmill at Mormon Lake, south of Flagstaff, in 1876. Edward Everett Ayer founded a sawmill there in 1882. This is what Milton road is named after, a shortening of the then “mill town” road. In the middle of a massive ponderosa pine forest, the A&P railroad created the perfect vehicle for cultivating large lumber businesses. As with any of these pioneering businesses, the isolation and lack of water created problems for Ayer. He hired Denis Riordan in 1884. He eventually bought the business in 1886 and renamed it Arizona Lumber & Timber Company. Michigan investors created the Saginaw Lumber Company in Williams in 1893, in direct competition with the AL&T. The Flagstaff Lumber Manufacturing Company and the Apache Lumber Company both showed up in the early 1900s. Though originally in strict competition, many of the sawmills began working together. By 1902, government control had stretched to the lumber business. Limits were put on land that could be used, amount of product that could be extracted, and wages that could be paid. The initial distinction of the Grand Canyon as a Forest Reserve meant that government controlled land could still be used with a permit. Regardless of if the government chose to continue with preservation and not auction off the lands or if they chose to do so, Riordan and the AL&T was still in the seat of control. Riordan strongly advocated for conservation, though it is thought this was for his own economic benefit, not necessarily his own beliefs. 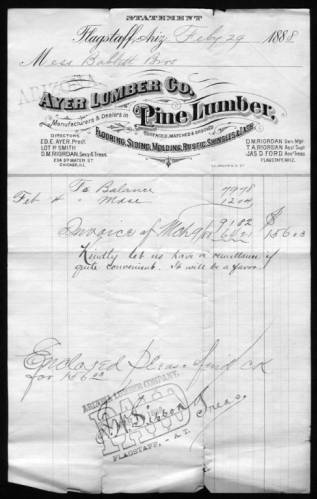 Bill from Arizona Lumber Company to Babbitt Bros. for $156.03 dated March 9, 1888.